Updated on 22.09.2011 - The Cafe under the name of "San Francisco" has stop operating. Therefore, the Cafe has been taken over by Tong Hing. 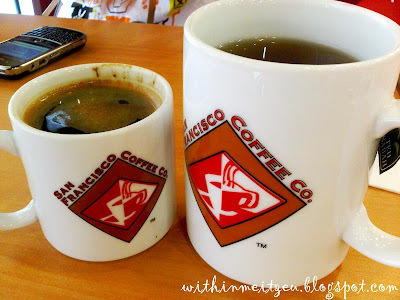 It wasn't really the American San Francisco, it was the San Francisco Coffee Co. outlet located in Tong Hing Supermarket, downtown of Kota Kinabalu, Sabah. 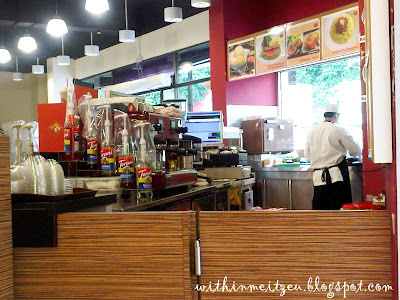 Before I headed to my make up class by The Body Shop on one Saturday morning, my elder sister and I had our breakfast there for the first time. Besides having various All Day Set Menu, they serve Ala Cart too! We even found out that they even includes set menus for a cup of afternoon tea with Ice Cream (Ben & Jerry or Baskin Robbins) Waffles, Cakes and others. Both of us ordered two different type of Breakfast Set which took about 15 to 20 minutes to prepare. Furthermore, we need to choose drinks either Coffee, A huge cup of Tea (Sabah Tea and Lipton Tea for our selection) or Juice which came together with every Set Menu selected. 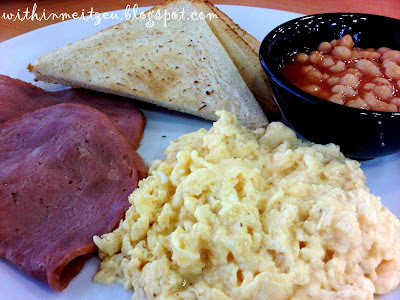 I had American Breakfast Set, I can't finish the whole plate because it portion was huge with slices of Ham, 2 slices of bread which cuts in to four, scrambled egg and Bake Beans. 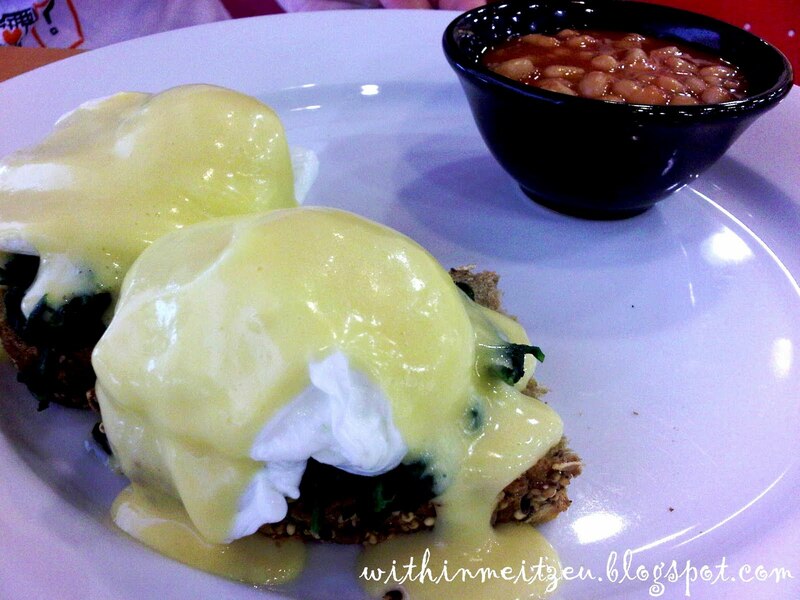 The scrambled was wonderful! It's fluffy, soft and tasty. Never tried it before, and it taste great with the spinach, the whole meal bread and the 90% boiled egg. *Scrumptious* and taste heavenly. The taste of the creamy cheese sauce on top was quite special that it doesn't taste like cheese. See my satisfied face with the Breakfast Set I had!! Hmm... Never heard about S F Steak House tho. I only know that they serve good food, and only the outlet have various kind of breakfast among all the outlets in Sabah. oh ho... i know dat tong hing supermarket.. hihi.. but S F is my 1st time!! da menu look delicious loo... thumbs up! =D Go and have a try!! Its really good! 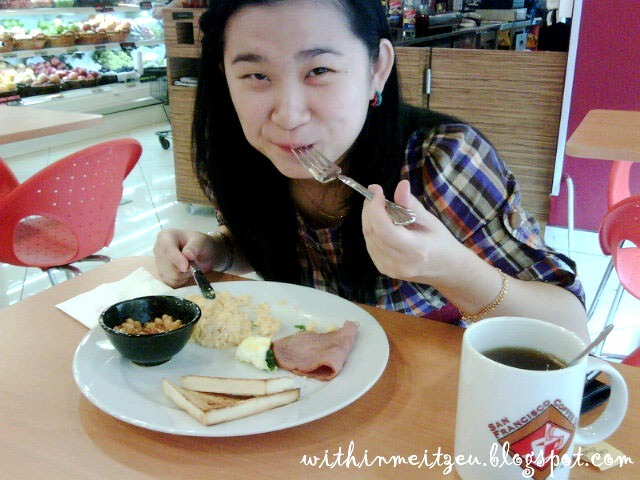 Hi Cath, you should go there for a try when you are back in K.K! !